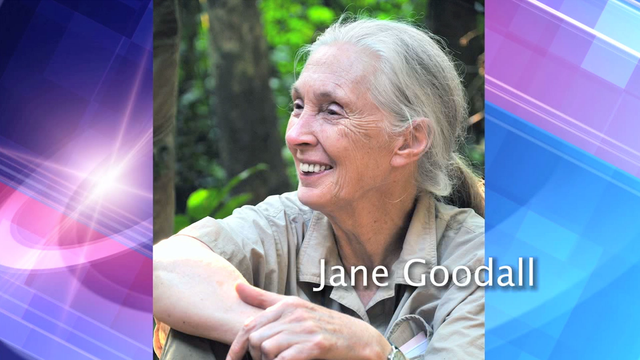 Bucknell University and WVIA present world-renowned primatologist and conservationist, Jane Goodall’s Bucknell Forum speaker series presentation, “Sowing the Seeds of Hope" Monday, Sept. 29, 2014 at 7 p.m. on WVIA-TV. Goodall's talk, "Sowing the Seeds of Hope," will focus on sharing stories from her new book, Seeds of Hope: Wisdom and Wonder from the World of Plants, the impact of her groundbreaking chimpanzee behavioral research in Gombe and her fascination with animals and Africa — as well as explore the current threats facing the planet and her reasons for hope in these complex times. Goodall has been called "the woman who redefined man," and for a good reason. Her research has fundamentally altered scientific thinking about the relationship between humans and animals. Her study of chimpanzee behavior began in 1960, in what is now Tanzania. There she made one of the most important scientific observations of modern times: Goodall witnessed an animal — a chimpanzee — not just use a tool, but make one. Thus began her work at Gombe Stream, considered the foundation of primatological research. In the past 50-plus years, Goodall has changed our perceptions of primates, humans and the connection between the two. In 1977, she established the Jane Goodall Institute, which continues the Gombe research and is a global leader in the effort to protect chimpanzees and their habitats through community-centered conservation projects throughout Africa. In 1991, she and a group of 12 Tanzanian teenagers established the global environmental and humanitarian youth program Jane Goodall's Roots & Shoots. Today the program has more than 150,000 members in over 130 countries, all working on local and global service projects to better the lives of humans, animals and the environment.